A number of boxing web sites have reported how news from Germany says lineal heavyweight king Tyson Fury will face unbeaten 24 year old Tom Schwarz on June 15th in the first fight of Fury’s multi-fight deal with ESPN. The fight set for The Thomas And Mack in Las Vegas will see Fury, 29-0-1(24) return to action for the first time since his thrilling December 2018 draw with reigning WBC heavyweight champ Deontay Wilder. It was hoped these two would fight again in an immediate rematch, but now we will have to wait, at least until after Wilder gets Dominic Breazeale out of the way on May 18th (assuming of course Wilder does not suffer an upset defeat) and until after Fury deals with the little-known and somewhat untested German (again, assuming Fury also avoids stepping on a banana skin). Schwarz, 24-0(16) is a big enough guy at just over 6’5” (Fury of course, at 6’9,” holds considerable height and reach advantages over every opponent he fights) and he has defeated some decent and recognizable names during his now almost six-year pro career. Men like Konstantin Airich (Wpts), Senad Gashi (W DQ – Gashi fighting Dereck Chisora next month in London) and, last time out on the 2nd of this month, Kristijan Krstatic (a KO win for Schwarz) have all been dealt with – but is Schwarz ready for a big, big fight with Fury? 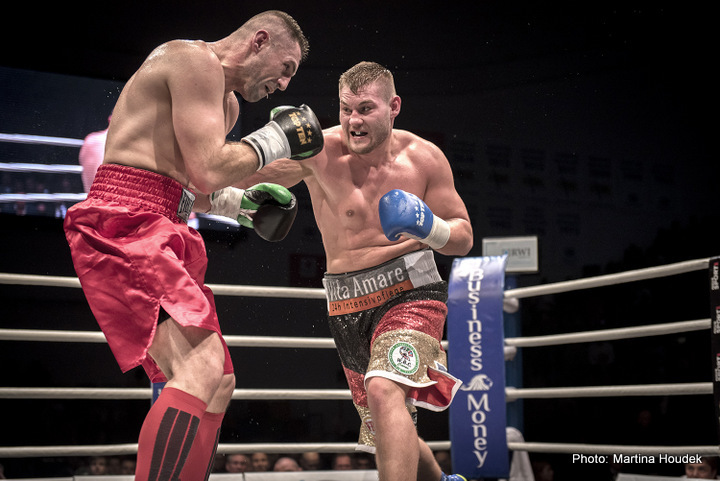 Yet to box as a pro outside of Europe, with almost all of his fights taking place in Germany, it remains to be seen whether or not Schwarz can hold his nerve on the big stage. Fans may be more than a little disappointed at this choice of opponent for Fury, and it’s possible not too many fans will be turning up live in Las Vegas for this one. Maybe Fury is entitled to one “easy” or “safe” opponent as he begins his fights on ESPN – for the U.S fans to get to know him, as promoter Bob Arum might say – but this fight does mark a step down for Fury, especially after that epic with Wilder. Still, as we all know, anything can happen when two heavyweights collide, and Schwarz is unbeaten and he has those 16 KO wins. Fury will of course be a whopping great betting favourite heading into this fight.